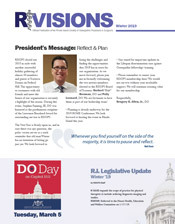 Download the latest RIVisions newsletter or browse the interactive version in your browser. RISOPS announces a partnership with BMW/MINI Cooper for participation in the BMW Corporate Fleet Program. This promotional program offers significant discounts on new car leases/purchases to active RISOPS members and their immediate family members. These savings would be included in addition to other current promotions. We are offering RISOPS members the opportunity to purchase Phillips Heart Start defibrillators at a 28% discount. George J. Pasquarello, DO, FAAO, of East Greenwich, Rhode Island, received the highest honor that the American Academy of Osteopathy (AAO) awards on March 25 during its Convocation in Colorado Springs, Colorado. Named the Andrew Taylor Still Medallion of Honor, the award is given to AAO members who have exhibited an exceptional understanding and application of osteopathic principles and concepts and for outstanding accomplishments in scientific or professional affairs. Designed for physicians in the osteopathic profession, the AHP Conference featured a series of training sessions covering a diverse range of knowledge and skills to aid leaders in the field of Osteopathic Medicine. Attendees received expert advice on successfully advocating for patients and engaged in discussion on topics such as grassroots advocacy, emerging issues in health policies, and technological innovation. RISOPS was represented at the gathering by board member Halina Harding, DO. Osteopathic Medicine is the epitome of care. It combines all the science of today's medical technology and understanding with a hands-on approach taught during Osteopathic training. Doctors of Osteopathic Medicine (DOs) are involved in all the medical and surgical specialties such as cardiology, gastroenterology and general surgery. The overall majority of DOs become primary care physicians such as family practitioners, pediatricians and internal medicine physicians. Primary care physicians do physicals, health and sick care for children and care for the vast majority of medical problems for patients of all ages. They order tests or refer their patients to a specialist, if needed. All DOs are trained in Osteopathic Manipulative Medicine (OMM), which involves touching or palpating the patient's muscle, skin and bones to help make a diagnosis. Specific OMM techniques can then be used to correct the abnormalities. There are OMM specialists, but all DOs are trained in OMM allowing them to gather additional information to better diagnose and treat their patients. So, in this age of medical technology, DOs are well-trained in using the latest technologies, but can also use the personal aspect of touch in a diagnostic and therapeutic way. The American Osteopathic Association puts it this way: “DOs: Physicians treating patients, not just symptoms." Fortunately, in Rhode Island, there is a significant group of osteopathic physicians. RISOPS is the organization that represents and is committed to these physicians and their patients. Educational conferences, such as the ROME Conference, are scheduled to keep these DOs up to date on the latest developments in medicine. This website, sponsored by RISOPS, provides a way for people to find a DO. RISOPS works to make sure your physician is reimbursed appropriately by the insurance companies so they have time to spend with you, their patients. RISOPS is working to keep malpractice insurance in line by having a fair legal system in this state. We don't want DOs, or any physician in this state, to be driven out of Rhode Island because of excessive malpractice expenses. RISOPS's mission is to offer our physicians the opportunity to provide the best care for their patients.